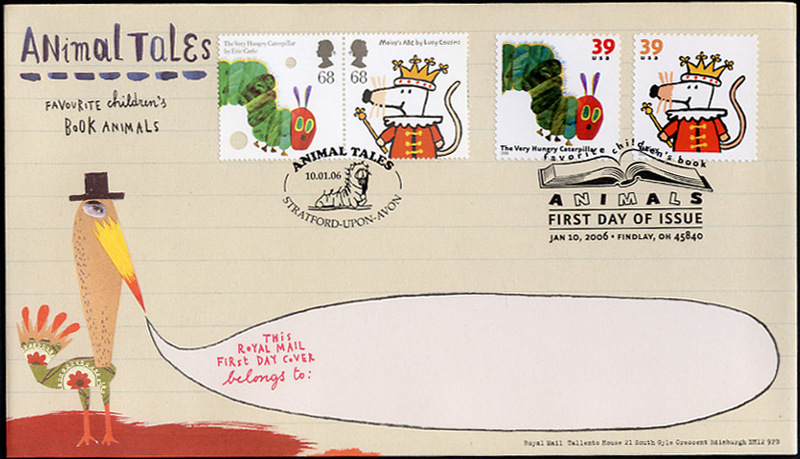 Great Britain stamps & first day covers - Animal Tales: Illustrations from Children's Literature - Joint issue with USA - 10 January 2006 - from Norvic Philatelics. On this page we are showing the FDCs that we have available, and some that we should be able to get from other suppliers. These are scans of actual covers unless stated otherwise; those from some other producers are taken from their websites. Most of these are available in small numbers - the quantity shown is the total produced - for PO, Stuart and Cotswold, the total produced by us in these combinations of stamps and postmarks, which may be unique to us. The quantity shown is not necessarily the number available now, as some have already been reserved by regular customers. Although we have issued a blanket email to customers and potential customers to advise that this page is available, we are or will be writing to individuals who have requested specific covers. 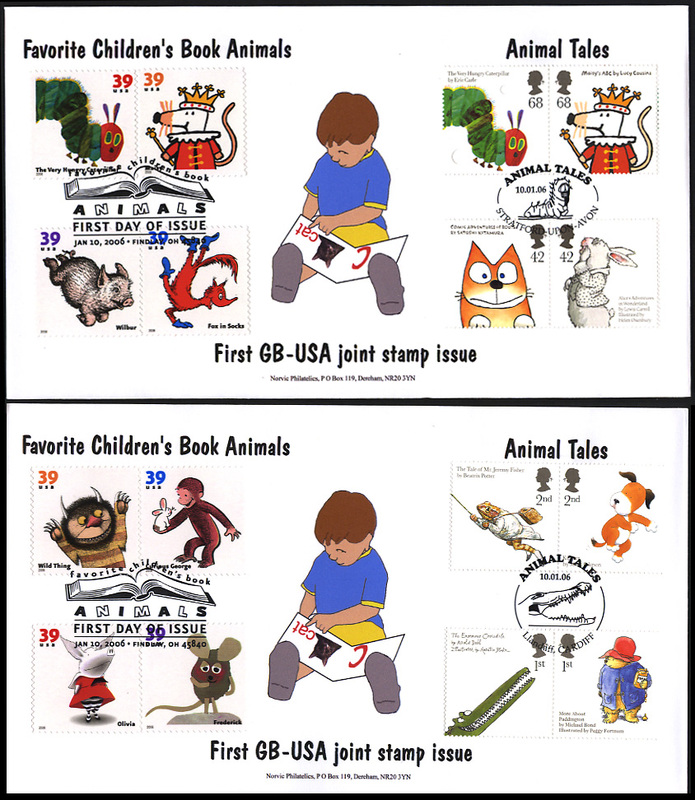 Not all covers that we showed before have been produced due to delays in receiving the US stamps. 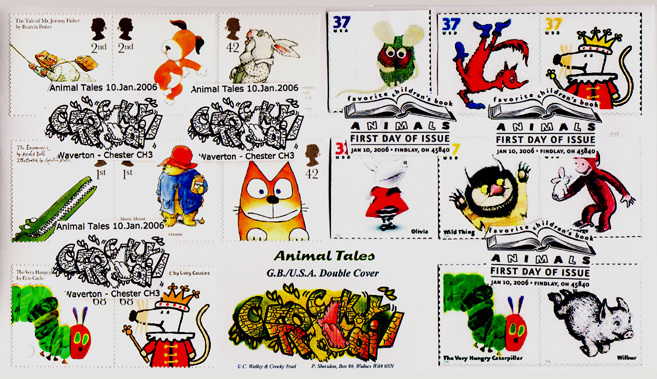 Some major UK cover producers ignored the American stamps and produced GB-only fdcs; some are producing pairs of covers (16 stamps), one at least is advertising a cover with 8GB+2US stamps on. Ref N61. 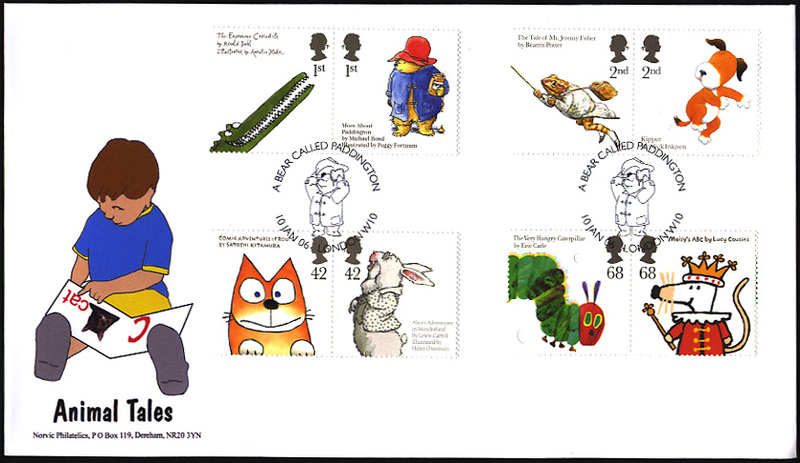 Set of 8 Great Britain stamps on Norvic fdc showing boy reading abc book - Price £8.95. 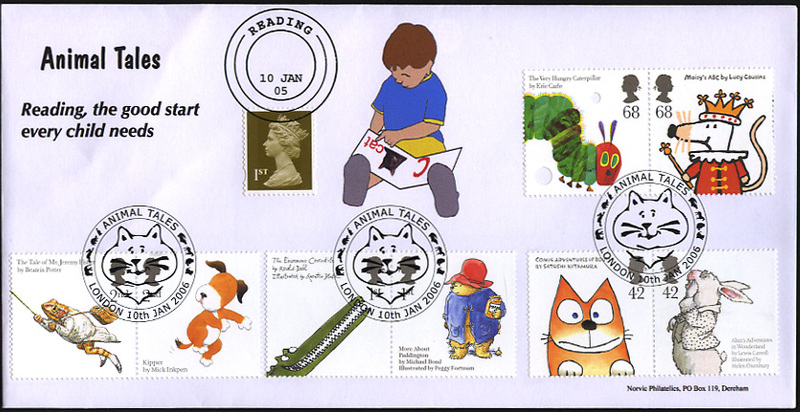 Ref N61D - Reading, the good start every child needs Norvic double-dated cover with READING 10 Jan 05 postmark on 1st class definitive and set of 8 Animal Tales postmarked London 10th JAN 2006. Cover shows boy reading abc book - Price £9.50. Ref N61J. 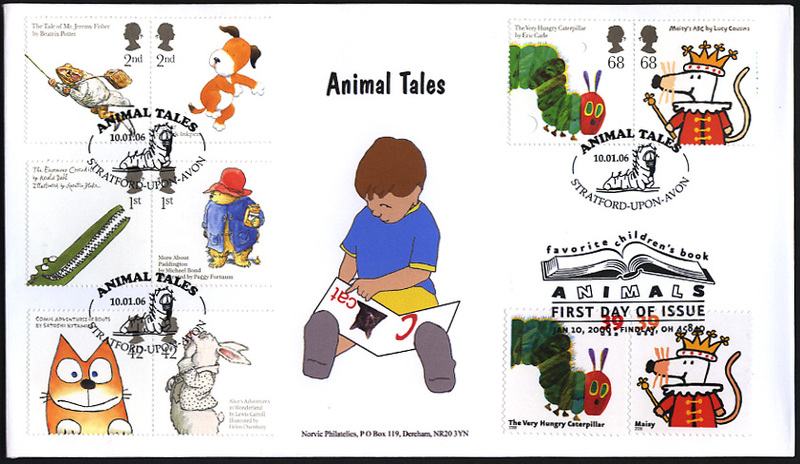 Norvic fdc showing boy reading abc book with set of 8 Great Britain stamps with Caterpillar postmark, plus 2 common design US stamps with 'open book' Findlay OH cancellation - Price £9.95. 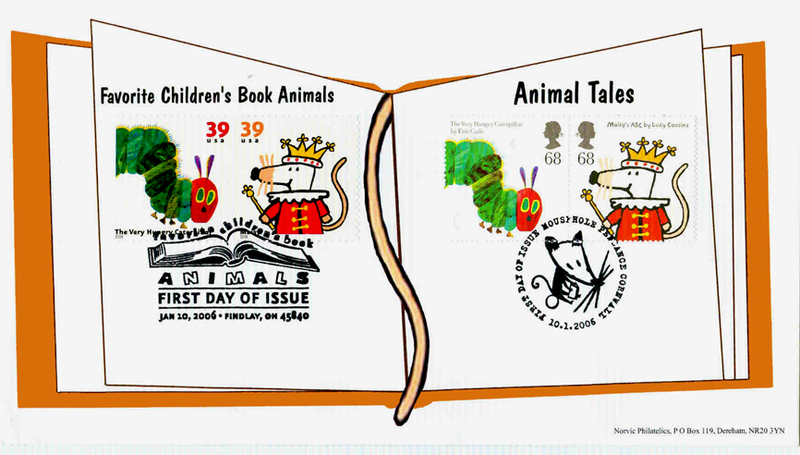 Postmarks M9894 (Caterpillar) & W9990 (Crocodile). 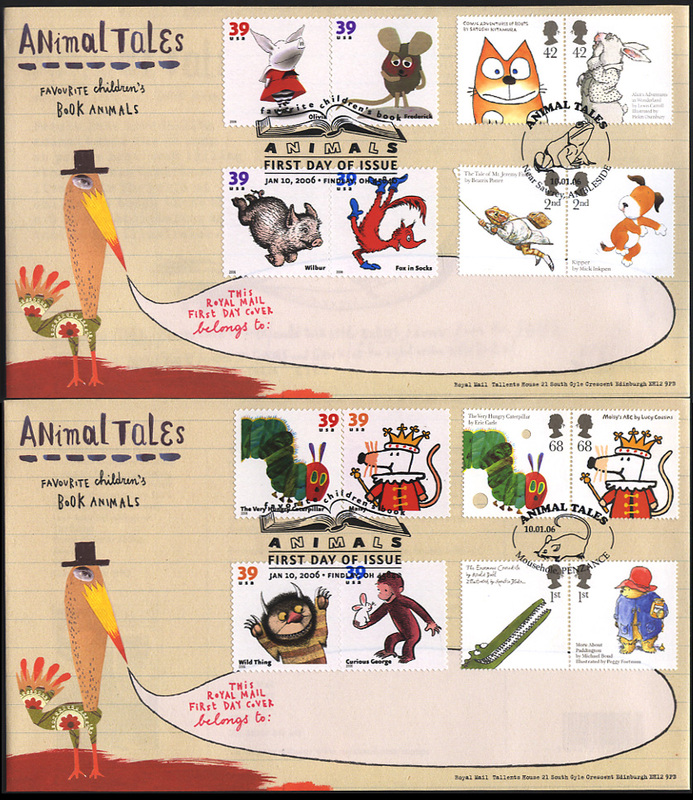 Limited edition 10 pairs - only sold in pairs for two complete sets of stamps. Note this cover is the same colour as N61U, but was scanned in a different way. 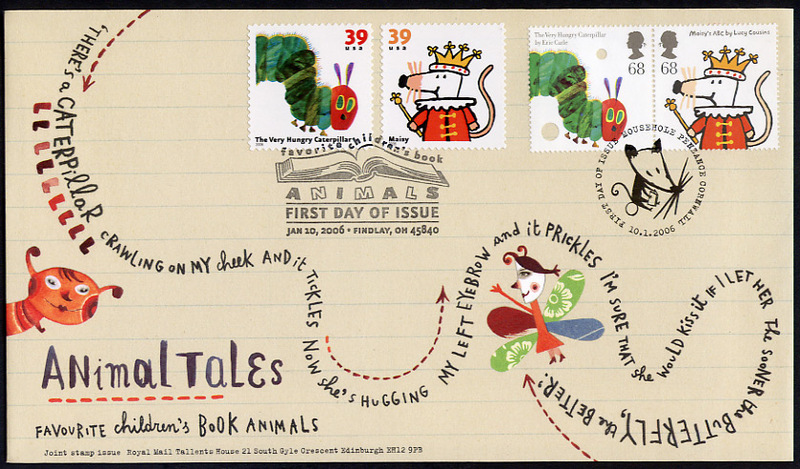 Norvic open book fdc with both US & GB Maisy and Very Hungry Caterpillar stamps all cancelled at the First Day Ceremony in Findlay, Ohio - exclusive to us. Limited edition of 20 - some were sold in the US. Note this cover is the same colour as N61A, but was scanned in a different way. 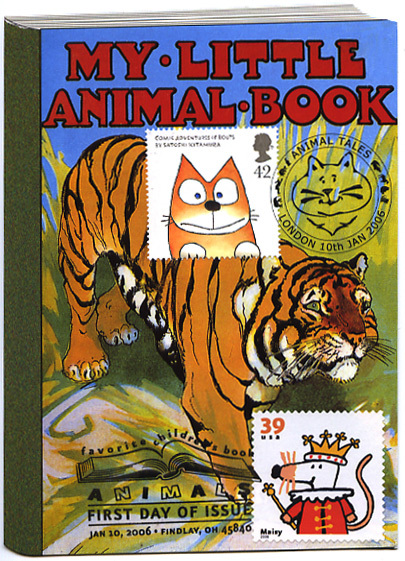 'My Little Animal Book' freeform postcard showing a tiger, with British 42p 'Boots' cat stamp cancelled with a London 'Cat' postmark and US 'Maisy' mouse stamp cancelled with the official Findlay Ohio 'open book' cancel. 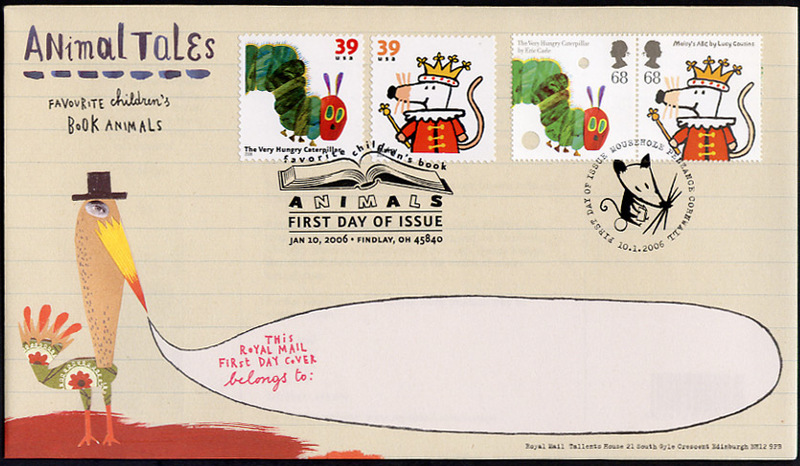 Postmarks N9898 - Sam the snail, and FINDLAY, OH. Price £9.75 per pair - only 2 pairs produced by us. Pair of GB stamps and pair of US stamps in common designs with relevant postmarks. Only available as shown, with Mousehole, Cornwall and grey Findlay Ohio USPS postmark. Not available with full set of GB stamps on. 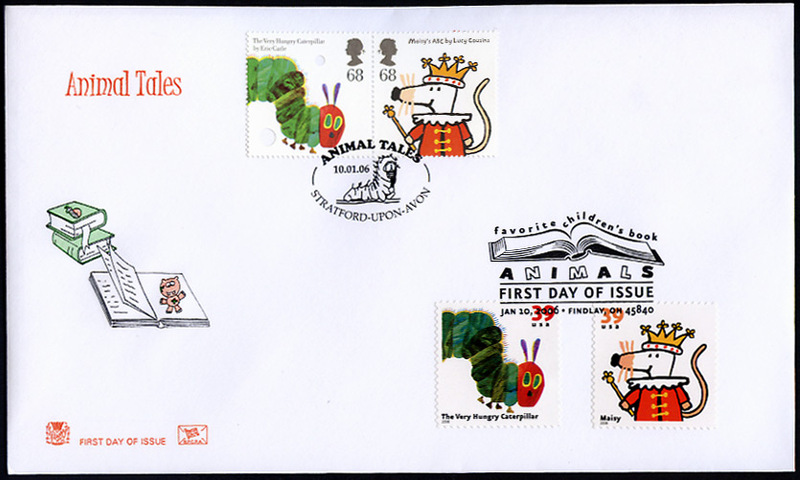 Ref R1JA Royal Mail fdc with both US & GB Maisy and Very Hungry Caterpillar stamps with STRATFORD (caterpillar) and FINDLAY OH (open book) cancellations. 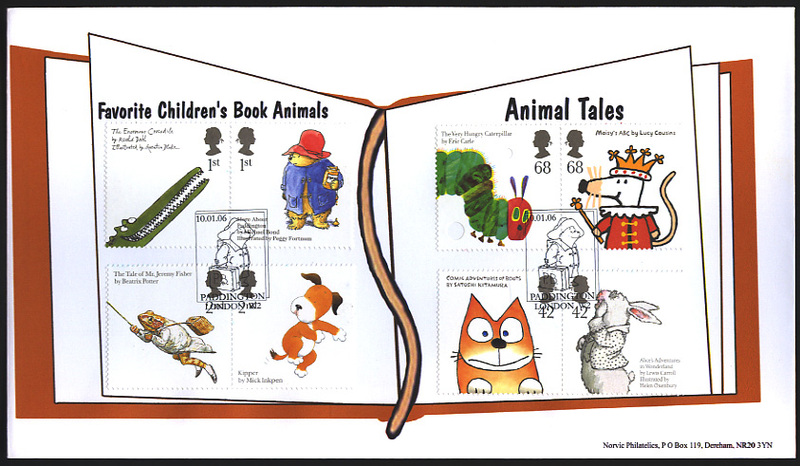 Ref R1JB Royal Mail fdc with both US & GB Maisy and Very Hungry Caterpillar stamps with MOUSEHOLE (Maisy look-alike) and FINDLAY OH (open book) cancellations. 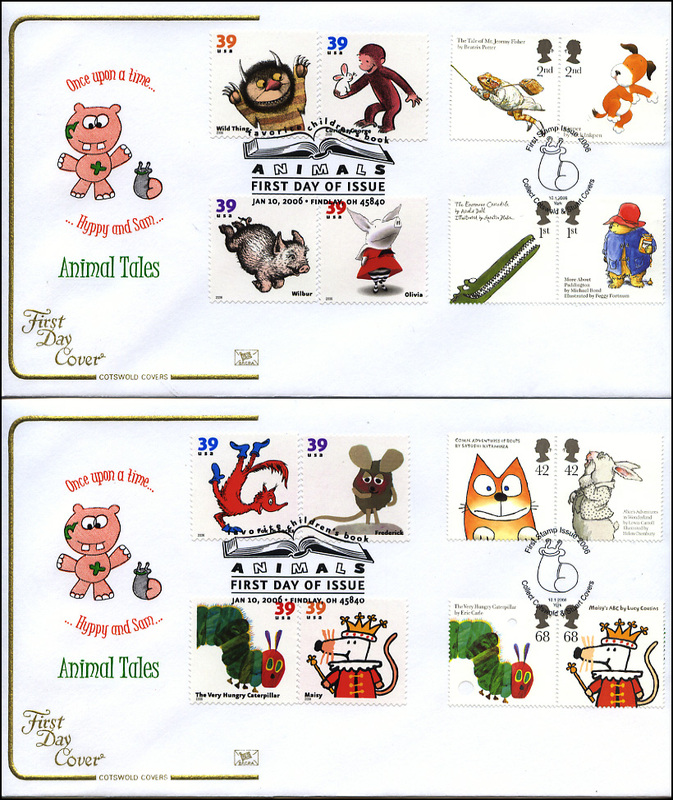 Ref R1JC Pair of Royal Mail fdcs with full sets of both sets of 8 of US Favorite Children's Book Aimals & GB Animal Tales stamps FINDLAY OH (open book) cancellations on the US, and MOUSEHOLE (mouse) and AMBLESIDE (frog) postmarks on the British. Price £9.50 per pair not available singly. We hope to be able to provide at these prices: this will depend on whether their advertised prices are net or have p&p additions. We may be able to offer further covers from other producers as information becomes available. Visit our online shop! - Animal Tales products will be added after existing customers have chosen from this page.